Many regulators and political decision-makers are considering policy initiatives for reducing GHG emissions from the energy sector. But too often they seem to have tunnel vision on the various technology pathways available to achieve GHG emission reduction goals, favoring a particular set of technologies above others. The Western Energy Institute, a prominent industry organization including all major electric utilities, gas utilities and pipelines in western North America, recently hosted a panel discussion on the topic of "What are the best decarbonization pathways for our customers?" The discussion was featured on the cover Western Energy magazine this spring. 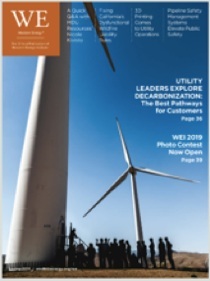 The article summarizes and draws conclusions on points of policy consensus across the utility industry on the decarbonization set of issues. In 2017 Enovation Partners was named one of the "Seven Small Jewels" in the consulting industry by Consulting Magazine. Forbes: "Profit Pressures Push Power Companies To Merge, But Regulators Pose Wildcard"
Read it in FORBES: "Profit Pressures Push Power Companies to Merge, But Regulators Pose Wildcard"
“We have had gas and electric mergers for a long time but the electrics are motivated right now,” says Bill Kemp, founding director at Enovation Partners. "Decreasing oil and natural gas prices, regulatory transformation and technological disruption means an increase in demand for innovative utility consultants ready to help clients meet the demands of a new energy consumer." “To a large degree, it’s about helping people build new companies, new ventures, or new business models,” says Enovation Partners’ founding director Bob Zabors, regarding energy storage challenges.